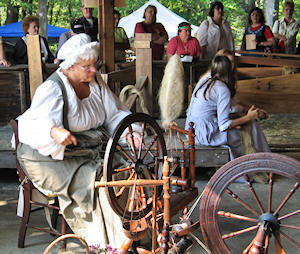 The Flax Scutching Festival offers demonstrations of the complete process of making Linen from the Flax plant. The festival also has great homemade food, crafts, antique farm equipment, live music, civil war encampment, covered wagon train encampment and a staged Indian raid. The Indian raid is a realistic battle between Indians & Settlers, representing the hazards of the era.